If you want young people in your community to hear the gospel, first you need to get them to your event! Silent Disco is something that is easy to invite people to and they will want to come. Because Silent Disco is contemporary and relevant to today’s youth, the good news that they hear at the event will also feel more contemporary and relevant. Want to give them something to talk about with their friends and families? Give them Silent Disco. It is new, it is trendy, it is hip and most importantly, it is beyond fun! One of the most important elements of outreach programs is to give your congregation a story that is easy and fun to talk about. Silent disco can do that for you because it is so new and exciting. Fellowship is enhanced through sharing new experiences like Silent Disco! People connect best when shared experiences are combined with shared interests and conversations. Silent Disco can be one of those experiences. Many people tell us they had more fun at Silent Disco than they’ve had in months! Is there a more powerful testimony for a shared experience? Is there a more fertile ground for fellowships to grow and for relationships to deepen? Is there a better way to strengthen communities and to grow new ones than through shared laughter and fun? Silent Disco works where a traditional DJ can’t. Often youth-group retreats are at a location or time where a traditional DJ would disturb other people in the area because they are too loud. Silent Disco is -well, …silent. You can have your event in your backyard, in a park, in an urban apartment, in a library, or on the street! All of the loud music is in the headphones! Each headphone has its own volume control. For all of its silence, it is not just rising trend that the young people really love, it is also a rising trend that oldsters really love- albeit for different reasons. The youth love it because they can have the music as loud as they want and the oldsters love it because they can have the music as soft as they want. Also, because we offer three channels of music, each channel can be a different music style. One for each demographic in your group. Each headphone has its own volume control and changes color as you change the channel. While the silent disco headphone systems work well with a DJ, they also work well with streaming playlists from Spotify or your favorite streaming service. Streaming playlists make it easier for leaders to control the musical content. You supply the streaming music from your phone, tablet or laptop. We also have a portable battery powered transmitter option if you want your event to be in a park or campground where there is no electrical outlets. Since the headphones are battery powered and you can use your battery powered cell phone to stream an automated playlist, battery powered transmitters are the capstone that allows you to work completely off the grid! Both the headphones and the transmitters will operate ten hours on a single charge. Make sure your cell phone is on a full charge before you start and you are good to go! Ask us specifically if you want the battery powered transmitters because we also have the regular kind. *Important to know: The Silent Disco system does not need WiFi. The transmitters generate their own FM signal which is received by the headphones. **Remember that you will need a cell phone signal if you are streaming music from the Internet. The kids love the Silent Disco trend and that is why churches do too! The best way to reach the young people is with something that is new and exciting! Silent disco packs the dance floor and gives participants a brand new way to interact with music and each other. 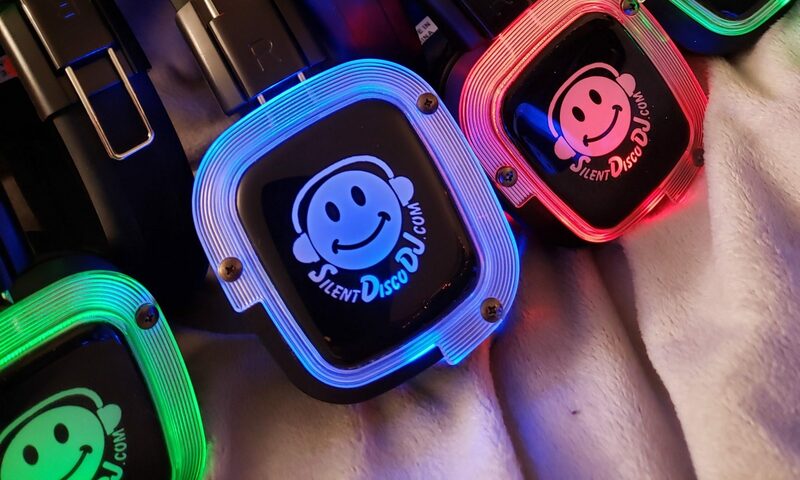 The objective of 3 channel Silent Disco is to have 3 audio playing devices; one attached to each of the three transmitters, thus giving the participants who are wearing the 3 channel headphones a choice between three different songs at any given time. Hi, I’m Johnny Only and I am holding the exact headphones that we send you. -Each of the three audio devices (one for each transmitter) should be playing a different playlist throughout the event. -Each of the three transmitters are broadcasting from their own audio device. Participants wearing the headphones have a channel selector with which they can switch their channel (thereby switching the song) they are listening to at any given time. It is difficult to describe just how much fun this is. It is also difficult to understand just how much fun it is until you try it. You need to supply three devices to play audio. They can be phones, or any combination of three tablets’ laptops, ipods etc. -Devices that can play music that is either on the device – or stream music from Spotify or Apple music or Tidal, Amazon, Pandora, etc.- I like the streaming choice because you can choose from playlists that are already made for you – and some of them perfectly target any type of audience you might have. Can we use our own DJ for our Silent Disco Dance Party? Can we use our own DJ? You can absolutely use your own DJ. Most of my clients do. The transmitters are built into a briefcase so that all you have to do is plug in the electric. No wiring or changing settings is required. You plug your audio playing device(s) into the cord(s) coming out of the transmitter(s) and you are ready to party. From there, you plug into the provided aux cord and set the volume in your audio device. (It is set up to accommodate phones, computers, tablets, iPods and mp3 players of all types. I provide two other types of adapters to accommodate most professional DJ equipment. Note that I make sure you get the equipment at least two days in advance so that you have time to do a sound check and call me with any questions. Shipping is anywhere within the USA within five business days. I am in New York State, so, if you live close by, it takes less time. *Of course I have to receive payment far enough ahead for it to clear before I ship. **As noted in my website, shipping is free. And that is both ways. Payment – I need to receive the rental fee and security deposit before I ship your equipment. Once I receive the equipment back without loss, you get the security deposit back. We would also sign a contract that says how much each lost or damaged item costs in case of loss. The equipment – you get three transmitters so that headphone wearers can choose between three channels of different music. They can switch anytime during the party and they have their own volume control too. Which costs more? A regular DJ with loudspeakers or a Silent Disco DJ? Obviously one sound system can be heard by several hundred or a thousand people, but one headphone can only be heard by one person. With Silent Disco headphones, you pay $7 per guest. So with a small party, Silent Disco is going to cheaper than traditional loudspeakers and with a large party it will be more expensive. Regular DJ: $1000 -In my area, a DJ (using loudspeakers) that is considered professional quality is going to start around a $1000 and that price remains the same no matter how many guests are invited. With a sound system that uses loudspeakers, one price fits all! For a DJ with traditional speakers, it is one price regardless the number of guests. Silent Disco: $7 per headphone rental At www.silent-disco-rental.com, our price is $7 per headphone (minimum order is $280 or 40 headphones). So for a smaller party, the Silent Disco Headphones are going to be quite a bit less expensive than the loudspeakers. With the price being per headphone rental, that means that your costs go up quickly as the guest count rises. Those prices above, don’t include the cost of a DJ. At my company, the DJ’s fee is an additional $149 per hour if we are supplying the music, the players, the light show, our DJ skills and our master of ceremony skills. It should be noted that because our Silent Disco equipment provides you with three channels available to play three separate playlists, it is suddenly quite a bit easier to save the cost of hiring a DJ by using only automated playlists. Yes, we still recommend a professional DJ and even three professional DJ’s; One broadcasting on each channel. But our equipment makes it much easier to skip hiring and paying the professional DJ. With three channels to stream unattended-automated playlists, there is a much greater chance of at least one of them having a fantastic song playing at any given time. Guests are willing to pay a higher admission fee for Silent Disco Parties. Obviously, this doesn’t pertain to wedding receptions or parties where there is no cover charge, but an important detail is that people are willing to pay admission to your party because of the ‘cool’ factor. Silent Disco is hot and new and three times the fun of a regular party! Guests understand this and are willing to pay more for the added value. Think about how much more of a cover charge you’d be willing to pay for a Silent Disco party as opposed to just going to listen to some loud music on a traditional sound system? We DJ with both Silent Disco and traditional loudspeaker sound systems, contact us when your next party is coming up and we will help you decide which one is best for you. Silent Disco Compared to Regular PA Loudspeakers: Which is better? Silent Disco experience in red. Loudspeakers– You know it is going to be just like your last party with somebody always complaining about either the music selections or the volume. Silent Disco– Everyone is so excited that you are doing something new and exciting that coincidentally solves both the problem of song selection and volume level that has plagued every other party that uses traditional loudspeakers as a sound system. Loudspeakers– You have only one choice of song to hear at any given time. Silent Disco– You can choose between three songs (3 channel headphones) or silence at any given time. Loudspeakers– You are likely to dance if you like the song that is playing. Silent Disco– You are three times more likely to dance -because you are three times more likely to find a song that you will like. That is because there are three channels (three different songs) to choose from at any given time. Loudspeakers– You have no control over the volume. Silent Disco– You have your own volume knob on your headphones. Loudspeakers– If you want to talk for a moment, you lift your voice over the music. Silent Disco– If you want to talk for a moment, you lift one side off your ear and use your regular voice. Loudspeakers– If you want to talk for a while, you shout over the music or leave the room. Silent Disco– If you want to talk for awhile, you take off your headphones and use your regular voice even if you are in the middle of the dance-floor. Loudspeakers– If you are a non-dancer, you will leave early because it will be too loud to talk or hear what your friends are saying. Silent Disco– If you are a non-dancer, you will stay longer because talking and hearing is no effort at all. Loudspeakers– If you are a younger dancer, you will leave the dance-floor if you don’t like the song that is playing. Silent Disco– If you are a younger dancer, you will stay on the dance-floor because with three channels to choose from (three different songs), you can usually find one you like. Loudspeakers– If you are an older dancer, you will leave the dance-floor when the DJ pulls out the music you don’t know or like. Silent Disco– If you are an older dancer, you will stay on the dance-floor because with three channels of music to choose from, usually at least one is playing a retro hit that you like. Loudspeakers– You only have the mechanical light show that the DJ brings. Silent Disco– You also have the lights on the headphones that create a human light show as the dancers move. Loudspeakers– You have only one DJ personality to choose from. Silent Disco– You can have up to three DJ personalities to choose from. Loudspeakers– The party has to end on time to observe noise ordinances. Silent Disco– The party can keep going long into the night since the only loud music is in the headphones. Loudspeakers– Limited to where the party can be due to the loud music. Silent Disco– The party can be anywhere that can accommodate a group of people. Loudspeakers– If you live in the City or Suburbs, you can’t have the party in your backyard without the cops coming to shut down your loud music. Silent Disco– You can party in your own backyard without bothering the neighbors at all. Ask us here at www.Silent-Disco-Rental.com how we can make your next party the most awesome party experience you’ve ever had! You can contact us here. We are looking forward to hearing from you! But I want everyone to be together! Won’t headphones separate us? Silent Disco headphones do not separate people at a party. In fact, our headphones bring people together by solving the two problems that most often separate guests. What are the two biggest problems that guests have when they attend a party that uses loudspeakers, thus forcing everyone to listen to the same music at the same volume? Guests are concerned about the music volume and the music selections. Newsflash! Silent Disco headphones solve both problems! This article will discuss the differences between the traditional loudspeaker format and the Silent Disco headphone format when it comes to the two concerns of volume and content. I will show how loudspeakers separate guests over these two issues and Silent Disco headphones bring them together. First I will explain the two problems, then I will explain the solution. #1) A significant number of people literally leave the party when the volume goes up. #2) A few socialites with concerns about their hearing health stay but use earplugs. Have you ever tried to talk to someone with earplugs in? It can be difficult. Is that the level of togetherness you want? #3) Most people limit their talking because of the music volume and when they need to talk they must raise their voice to be heard by the other person. Is this the best you can do on togetherness? #1) A significant number of people literally leave the dance floor when they don’t like the song that is playing. The people who do like the song stay. #2) A few people never dance unless it is a slow song or a group dance they can do without a partner. I have seen many DJ’s limit slow songs and to one or two a night and avoid group dances completely. This means that some people are not getting together on the dance floor at all. #3) Musical taste tends to separate people by demographic. Older people tend to like older songs and will only dance to those. White males tend to like hard rock and will only dance to those. These are only examples and their are plenty of people that don’t fit the mold, but it is clear that different guests respond differently to different music selections. When only one song can be played at a time, that song is dictating who is together on the dance floor and who is standing off to the side- separated from the party by the music selection. There is no volume if you are not wearing the headphones – so the volume barrier is gone. It is easy to talk to each other. Those older folks who just want to talk, can stay the whole time! They don’t have to leave the party early! Each headset has its own volume control. So if you want to hear the music and dance, you choose the volume so you don’t have to go home early with a headache. If you want to dance and talk, you have only one side of the headphones on your ear or lift the ear cups just a bit during the conversation. The music volume drops right down due to the proximity effect of the headphones and you can talk easily for as long as you want. If you want to hear the music, talk, and not dance, you just wear the headphones around your neck. The volume will be just loud enough for you to keep track of what is playing. At the same time, conversation is at a normal speaking volume. And you hear everything the other person says. No more nodding and smiling because you didn’t understand what the said but are tired of yelling “What?” all the time. Now THAT is what we call togetherness! Our Silent Disco headphones give you the option of three different channels of music. This means the DJ is playing three songs at the same time. One channel might be oldies. One might be old school hip hop. Another might be top 40 dance music. The guests don’t have to leave the dance-floor because they don’t like the song that is playing, they just switch their channel and keep on dancing so more people stay on the dance-floor. They might be listening to different songs while dancing. They are dancing together! The fact that they are listening to different songs has nothing to do with it. They have the option of dancing to the same song if they want, but they also have the ability to choose between the two other channels and multiply their happiness with being TOGETHER on the dance-floor. Without the headphones, one person would be leaving the dance-floor and one person staying. That is separation! I can hear Seth Godin saying that some people just wish everyone would like the same music selections at he same volume. Yes, that would be nice, but it is not going to happen. Headphones embrace this truth instead of fighting it. In addition to the three different channels of music and your own volume control, Silent Disco Headphones also give you the option of no music! Yes, you can remove the headphones! And take a break from the music! Have a conversation with your friends and family about how much fun you are having together! You have the option of talking to your grandparents who decided to stay because the music is not too loud. Now they can actually talk and be together with their family and friends. Let’s all say it together! If you have any questions about how to integrate Silent Disco equipment into your next party, I’d love to help. You can contact me, email me or call me. We have the equipment you can rent and we have the experience that we can share. We give you a human light show for your next party! Lights play a big role in energizing the dance floor. DJ’s and dance clubs spend thousands of dollars on lighting in order to help the music come alive. While wearing our LED illuminated headphones, your dancers will become part of the light show! Battery powered, three channel, light-up headphones. The number one reason to choose our headphones is because they light up so very brightly! When dancers are wearing them, they literally bring the music to life! Oh yeah! And they sound great too! With 30-20K Hz crystal clear sound, your guests won’t want to leave the dance floor! The headphones light up according to which channel is selected, so as you look over the dance-floor, you can see who is listening to what song. Lighting technicians spend hours coordinating the lights to one song, but with real live guests wearing our LED illuminated headphones, they give the song a visual personality that no lighting technician ever could! You can still enjoy traditional dance-floor lighting, but light on dancers adds a whole new element. We are big fans of black lights at Silent Disco dances too. With black light parties, you turn the house lights much lower than you ordinarily would. The lights from the headphones are just enough to keep the room from being too dark and they add a whole new element to the fun! Once you get started with the looks of your party, you won’t be able to stop. I felt the need to buy myself a pair of LED Shoes for adults for adults the other day! If you want to have your guests create a human light show on your dance-floor, we would like to help you make it happen. Your friends are going to be sooo jealous! Earpieces light up Red, Blue, or Green depending upon which of the three channels you select. Notice that the headphones have a right and a left. This helps the user find their controls. Volume issues are usually caused by the volume of the source music being too low. If the headphones are not loud enough, it is because the source music is not loud enough. Additionally, the music going into each of the transmitters needs to be at the same volume in order for the headphone wearers to hear the same volume as they scroll through the channels. If you are using phones, tablets or laptops to run the music, start with their volume all the way up. Double check to make sure that both the hardware and software volumes on your devices are all the way up. Then if one device is playing louder than the others, back the volume of that device down until it matches the volume of the others. Make sure your DJ (or person running the music) is turning down their headphone volume before they turn down the source volume. This allows the dancers maximum ability to raise or lower the volume in their own headphones. Your headphones arrive from us fully charged, so you won’t need to charge them under ordinary circumstances. Use the charger jack on the headphones. When the Headphones are being charged, the charge indicator lights up red. When the headphones are fully charged, the indicator lights up green. It takes about 3 hours for the headphones to charge fully and they will run for about 10 hours per charge. The amount of draw on the batteries varies by the volume level, and so operating time varies accordingly. If you use the high setting, headphones too close to the transmitters will cause interference noises in the system. Our transmitters are already plugged in and set to the correct channels. For a typical sized party, the setting should be kept on Low. The only time you should use the high setting is if you are doing a huge block party or a multi-room party with a ton of people. Warning: If you do set the transmitter(s) on high, make sure there are no headphones close to it(them). It can cause an annoying crackle of interference under the right circumstances. You never want headphones right next to the transmitters, but the proximity effect is more pronounced when the power setting is on high. That being said, in some rooms you may find some radio-frequency dead spots where users are losing the signal. Go ahead and switch the transmitters to high. That will usually solve the problem. It looks plugged in but it is not. Sometimes you have to touch it or wiggle it in order to tell. Nine out of ten times, the problem is that something is not plugged in. Make sure everything is plugged in by checking every plug point with your eyes and with your fingers. From there, double check your music player or DJ mixer outputs. When you rent your equipment from us at www.silent-disco-rental.com, we give you our number so that you can call or video chat. From there, we can usually fix any problems that come up. Silent Disco: Trend or Fad? A fad is something that pops up in a culture for no particular reason and then disappears as quickly as it came. A trend is something that happens for a reason and stays around for the long haul because it fulfills a genuine need. As a full-time professional DJ for more than 30 years, I have some insights that definitely suggest Silent Disco is a trend instead of a fad, but don’t take my word for it! Take a look at my evidence. Let’s take a look at known history and how it points us toward the Silent Disco format emerging as the industry standard instead of the new kid in town status that it currently enjoys. Think of the history of a party from a guest’s perspective. First there was the live band. Guests had no choice in the type of music or the songs that the band played. They also had no control over the volume. Because of the volume question, party planners had to be careful when and where the party was – or the cops would show up to shut it down. Next there was the DJ playing pre-recorded music. Suddenly the listener’s choice of songs and styles had exploded. One band could only play the songs they knew while the DJ could play any song every recorded. Likewise, one band could only play their own style of music whereas a DJ could play any style of music as long as they had the record. The historical trend was toward more music options and more listener empowerment. We’ll see by the end of this article how Silent Disco headphones have become the next logical step. There were additional factors from the past that drove the demand by users to want more control over their own music. 1) Home stereo systems gave listeners control of their own volume. They developed their own concern about disturbing other people with their music. 2) The party guest soon had as much music at home as the DJ did. Proliferation of Radio and Internet continued to expand listener’s music preferences to a point where being subject to a DJ’s choice seemed limiting. 3) People started wearing headphones in public. Handheld players and streaming digital music give them unlimited music choices available to them any time. With the addition of headphones, users could listen to their own music without disturbing other people. Nowadays, when they are not at a party, people simply expect to have unlimited music choice, headphones and their own volume control. They always have control over their music. They have autonomy over whether they want to listen to music. They have listening comfort in the form of their own volume knob. So, how does that make them feel when they go to a party with a traditional speaker system that is playing so loud that they can’t listen to their own music and they can’t control the volume? Viewed in this light, a silent disco dance party doesn’t seem futuristic at all! It seems like it should have come around years ago! Look at the problems the headphones solve from a user experience standpoint! 2) Their own volume control! This means you get a choice! No more feeling bad about wanting the music louder or softer than your dance partner! 3) They get the option of not listening to the music at all! This may be the biggest win of all! Especially for people who want to talk to each other at parties. And with the noise problem taken care of, event planners don’t have to worry when or where they throw the parties. 4) You can now have a party anywhere and anytime without the noise – within reason, of course. Not only do the headphones allow dance parties in libraries and on lakeside beaches, but they allow multiple entertainment acts in the same space without volume problems. From a historical standpoint, the changing expectations of party guests point toward Silent Disco as a trend that is going to grow in magnitude and stay with us in the years ahead as a popular dance party format. A) The technology has become good enough and inexpensive enough to make it cost effective. B) The technology is easy to add onto existing DJ sound systems. Professional mobile DJ’s don’t have to change anything in order to add headphones to their list of options. C) The technology is easy for the general public to use; -No professional DJ required. If you rent the equipment from someone like us, music can be streamed from a Spotify playlist (or other similar services) through consumer level devices like a phone, iPod or tablet. D) Shipping services are inexpensive enough that we can rent the equipment to you at cost effective rates. Companies like us at www.silent-disco-rental.com ship it to your door no matter how remote. E) There is still room for growth momentum, making an already remarkable experience even better, so the user Wow-Factor will continue to drive demand through word of mouth. In summary, it is clear that the Silent Disco format is a trend instead of a fad. It provides high value at a reasonable cost by fulfilling a legitimate need and providing benefits for the users that are simply expected in today’s culture.